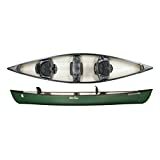 The Saranac 146 canoe packs in a ton of features at a great price. With a stable but narrow shape and slightly lowering the seats, we have developed a model that paddles better than most recreational canoes on the market. The Saranac 146 features rod holders, storage options and storage trays as well as two contoured seats with comfortable seat backs and a center bench seat (perfect for smaller passengers). From bow to stern the Saranac 146 provides versatility while delivering on fun. A great option for families, anglers or casual canoeists looking for a recreational canoe that performs well on the water. The Saranac is affordable family fun! made in USA specifications: length 14'6', width 36", width at 4" waterline 34.75", Bow height 18", depth 13.25", Weight 79 lbs., Max load range 700-750 lbs. Material: thermoformed polyethylene.